Virtual Roster, from Kronos is a specialized workforce management software solution developed to handle the scheduling, time and attendance, and labor analysis for casino resorts. Virtual Roster has been designed to automate the scheduling and daily management of a casino resort’s workforce and generate increased efficiency and effectiveness throughout the entire workforce management system, from planning and analysis to schedule creation and payroll integration. All departments across the property can use Virtual Roster to transform their workforce management. Virtual Roster is a comprehensive casino resort scheduling solution with manual, semi-automated and fully automated tools to ensure the right people are doing the right work at the right time. Ensure your team members are working in alignment with the schedule. From the arrival swipe to full payroll system integration, our solution will deliver a true end to end Time & Attendance workflow. Build a forecast, develop a staffing requirement and automatically generate forecast aligned shifts for all departments across the property. 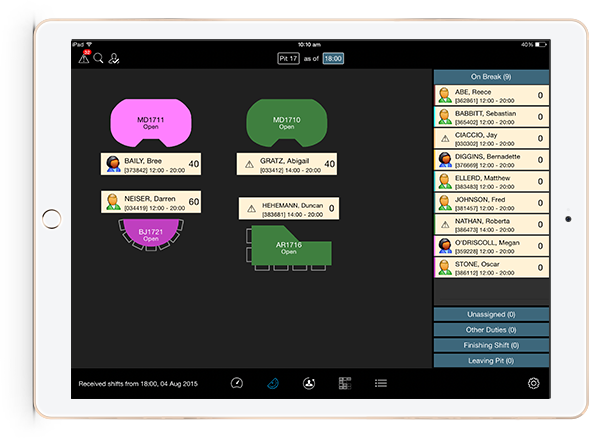 Our tablet application enables Casino Floor Management to view and action all of the changes that happen during the shift on the floor – live.